We are just about to wrap up this Mach 1. 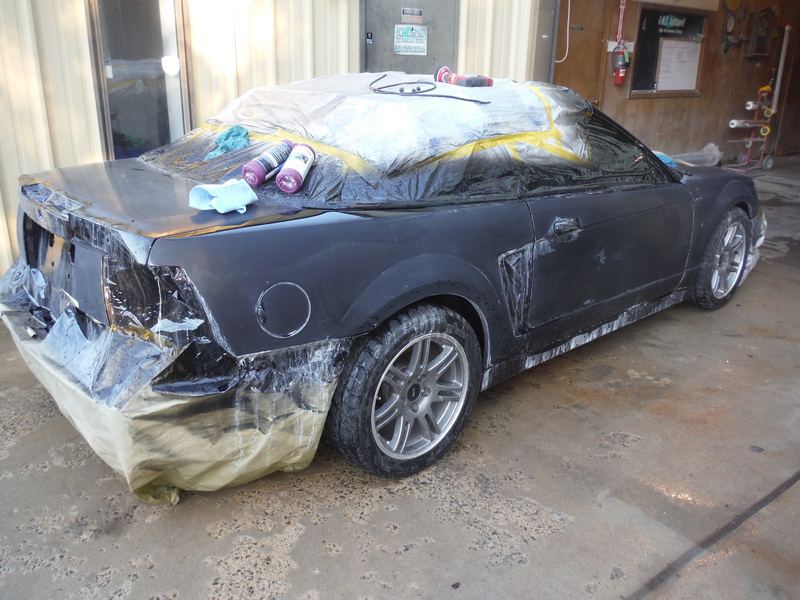 We had a storm come through a few weeks ago that damaged a few panels on this Mustang so we took care of that for the customer and while it was here we went ahead and buffed the rest of the car to get him ready for the upcoming show season. We also wired up sequential LED turn indicators that mount in the hood scoop for him. 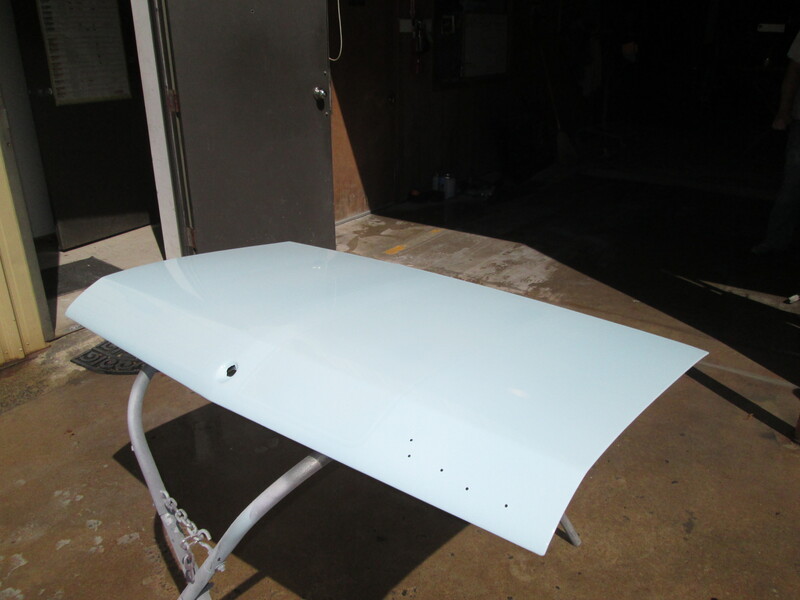 We are waiting on a new hood molding to come in which will be the final piece for this hot rod. It will be ready to go once that part comes in. The Cobra is moving right along. 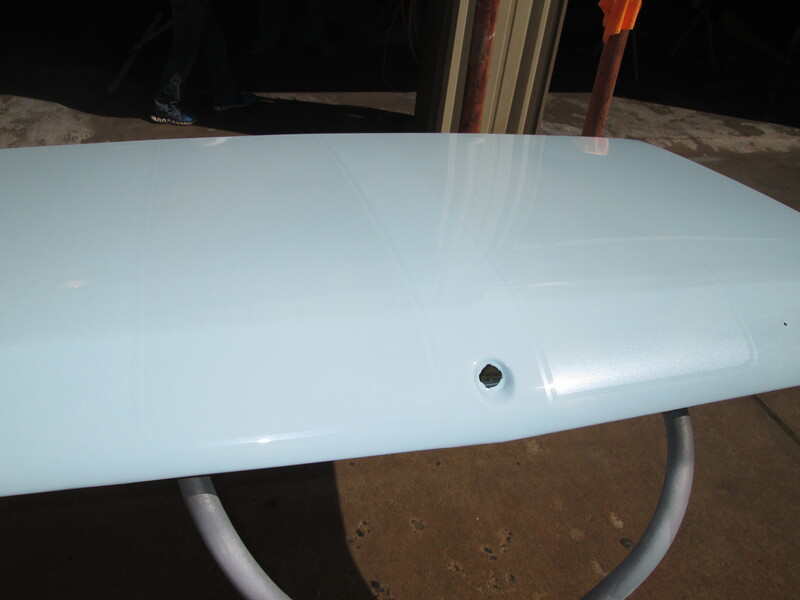 Here you can see in the first two pictures what it looks like after wet sanding the clear coat. This is what was done yesterday. 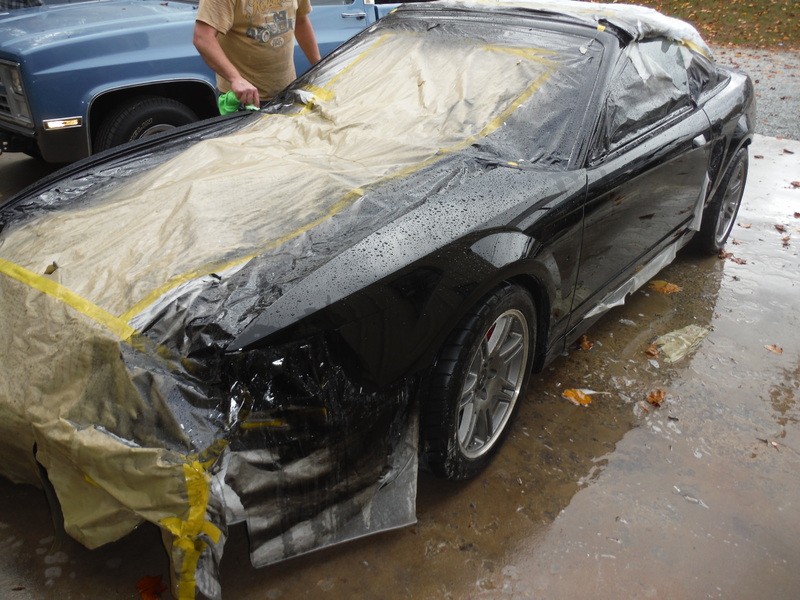 We sanded the entire car starting with 1000 grit sand paper then 2000 then 3000. Then we washed the car. 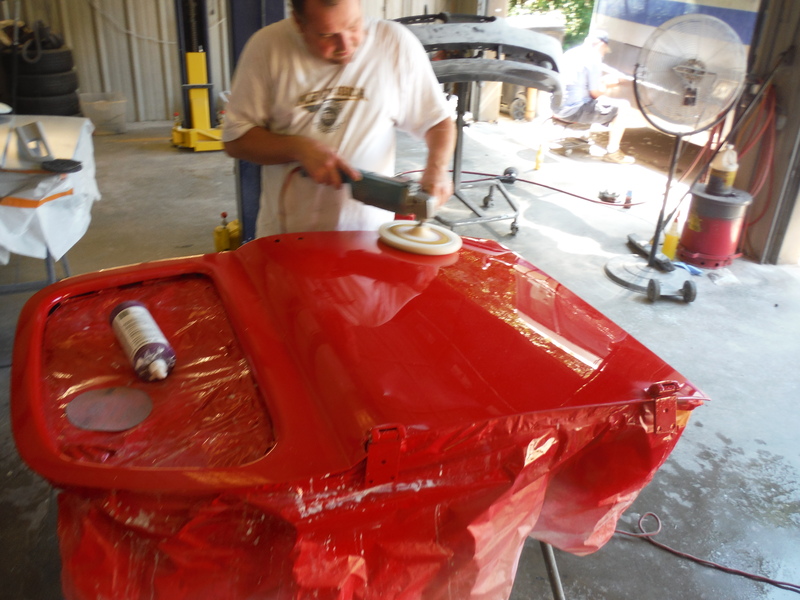 This morning Paul and Chris started buffing the paint back out to bring the shine back out. 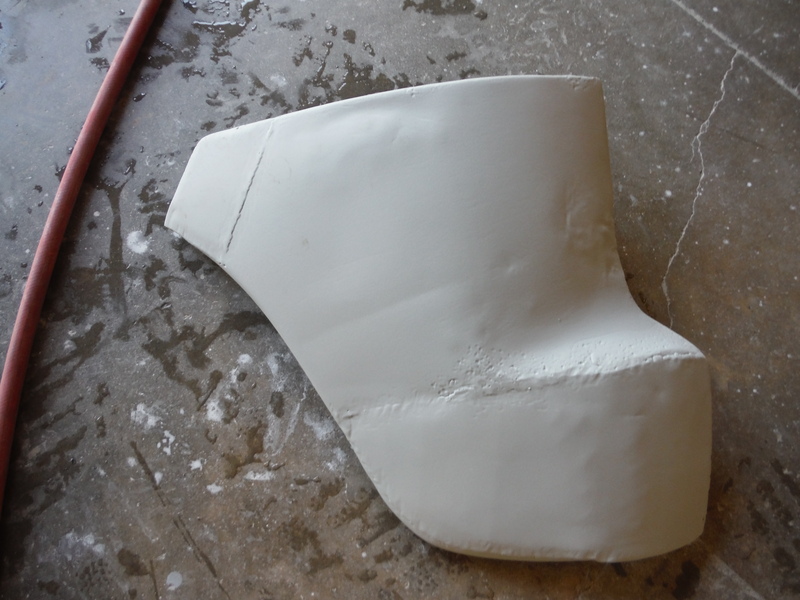 Just like the sanding process, its done in steps. 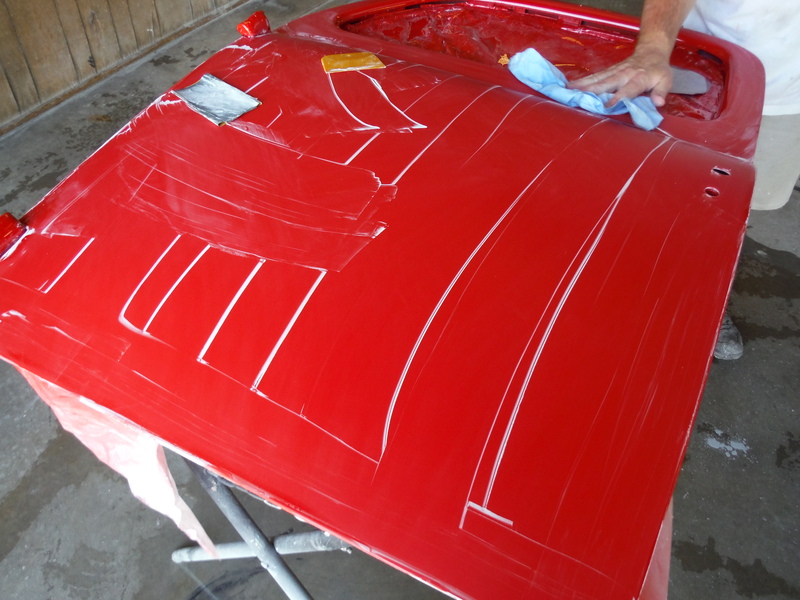 The first step is a heavy cutting compound that gets the scratches out. The next step up shines up the compound scratches. 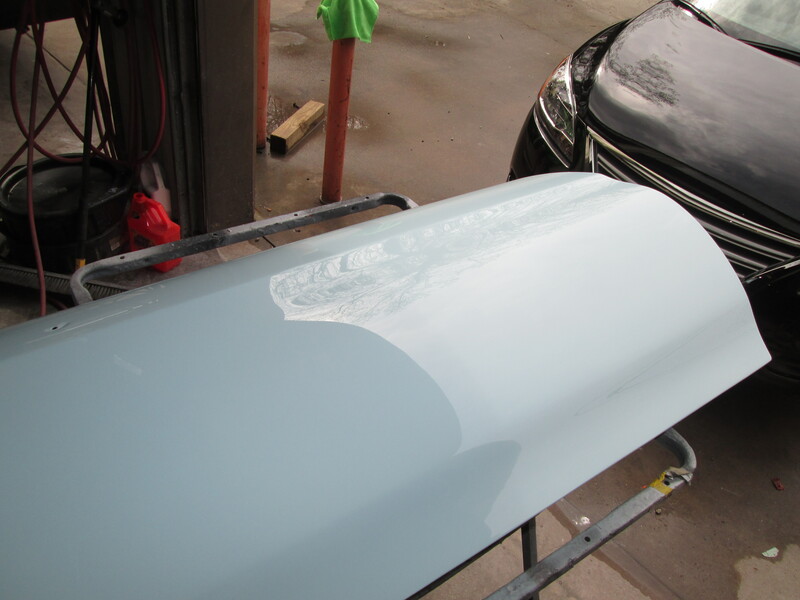 The final step brings up the high gloss back. This is where we ran out of time today. 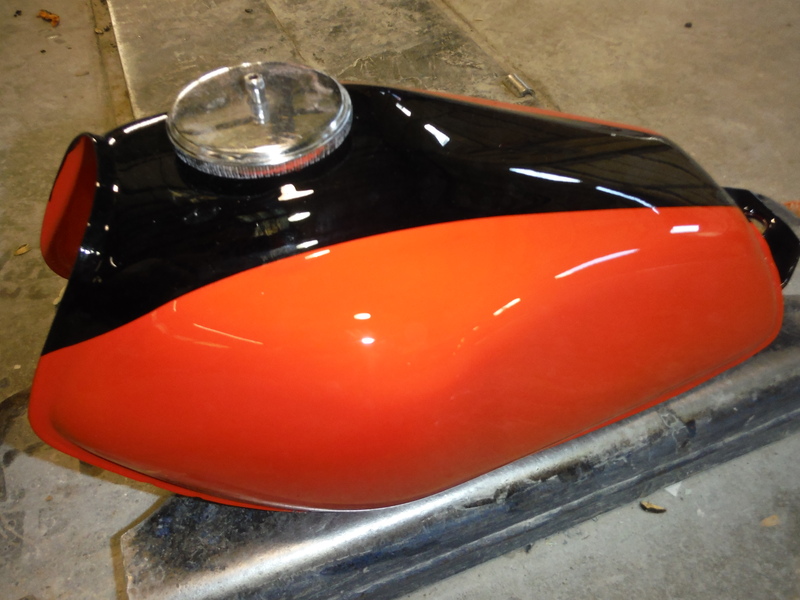 We will put a final hand polish on here next week and then start the reassembly process. Then this Cobra will be back on the streets. 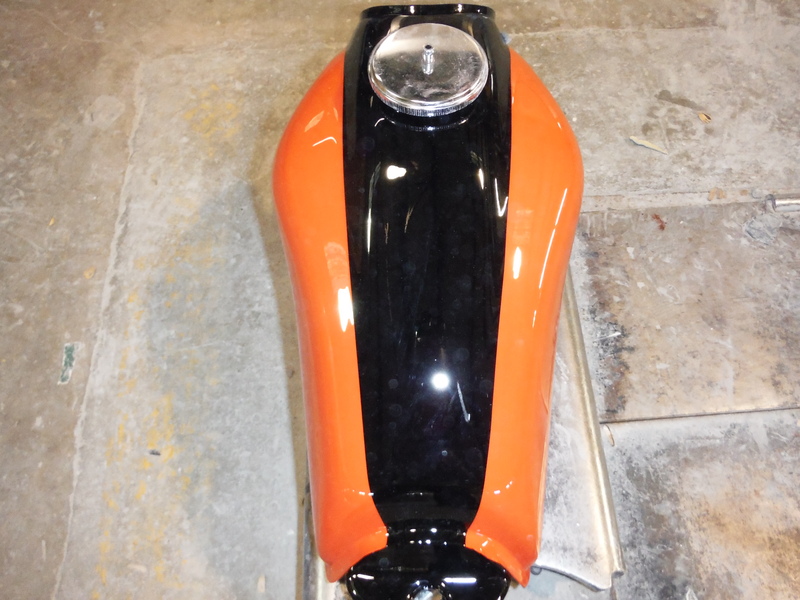 Here are the final pictures of the old school XR80. 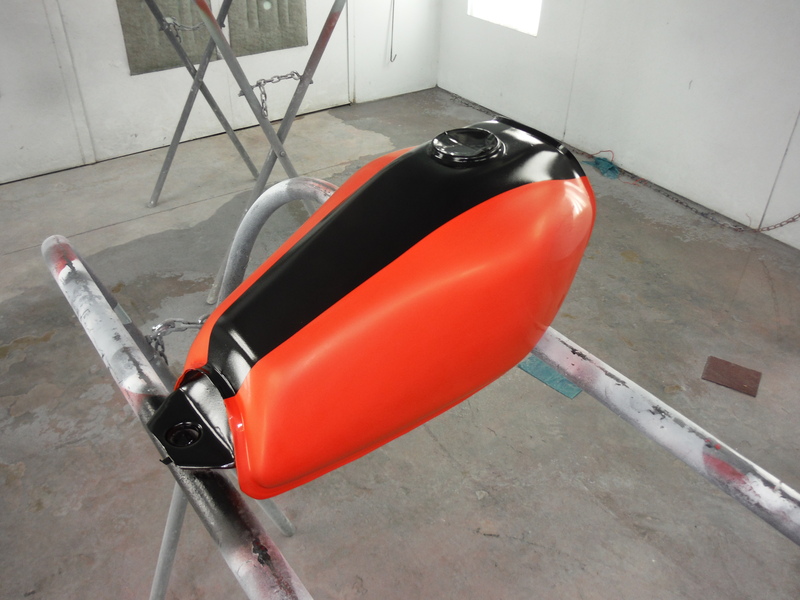 Yesterday we painted the the tank, today we painted black stripe and clear coated it. I sure hope the owner will bring it by the shop when he gets it back together. 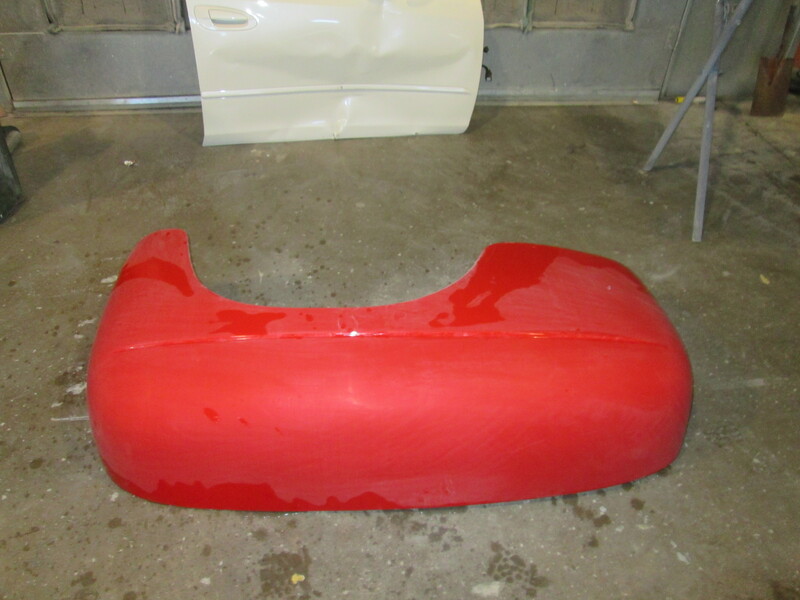 These are the fenders for the ’52 Ford. 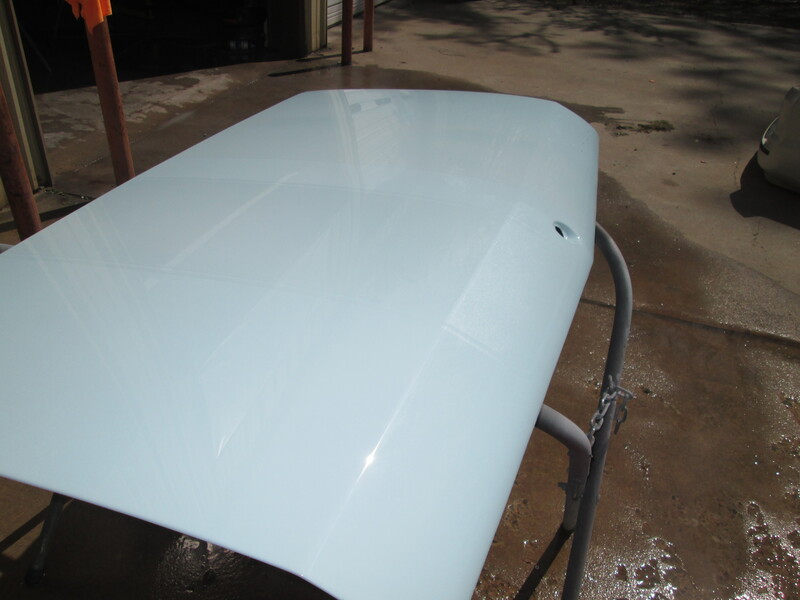 We wet sanded and buffed them today. We started with 1000 grit sandpaper and a block. 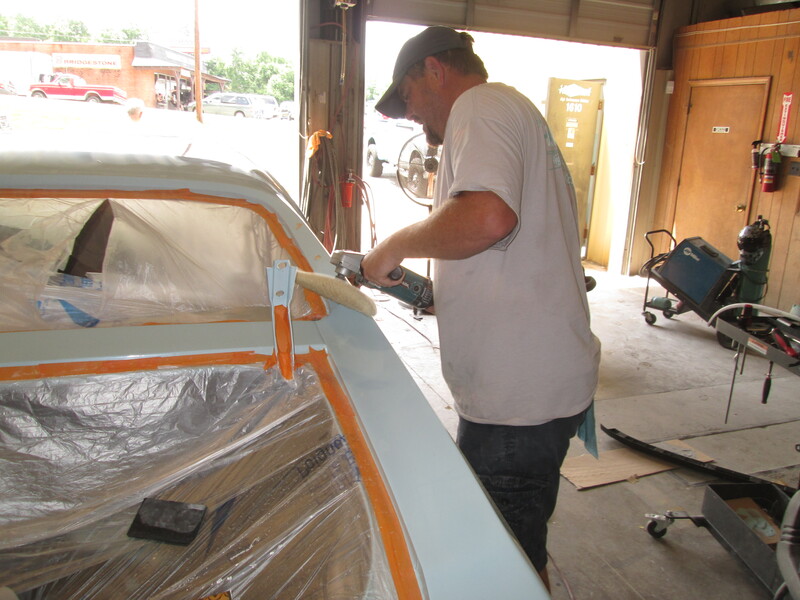 The block and 1000 grit paper is used to flatten out the clear coat and remove what little orange peel. Once we finished up with the 1000 by block, we went over it once more with 1000 by hand. We then switched to 2000. 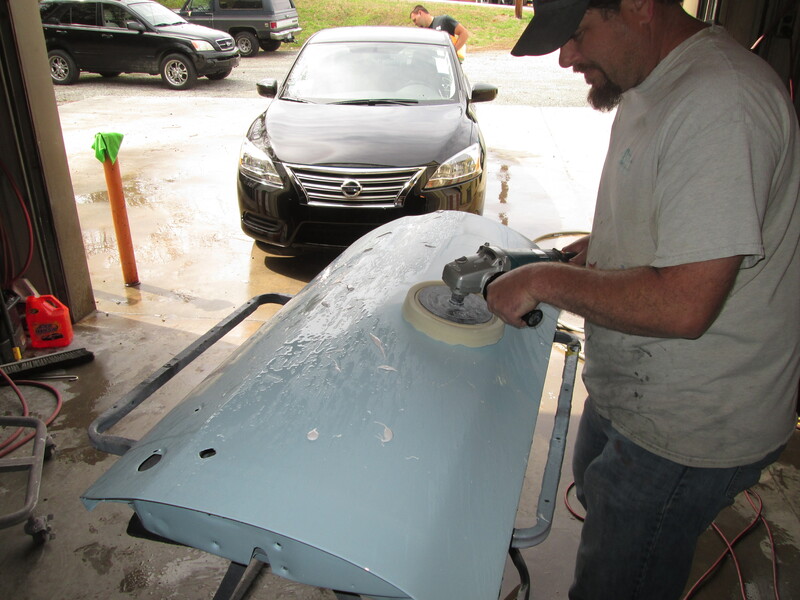 Lastly we went over the panel with 3000 grit on a dual action sander. 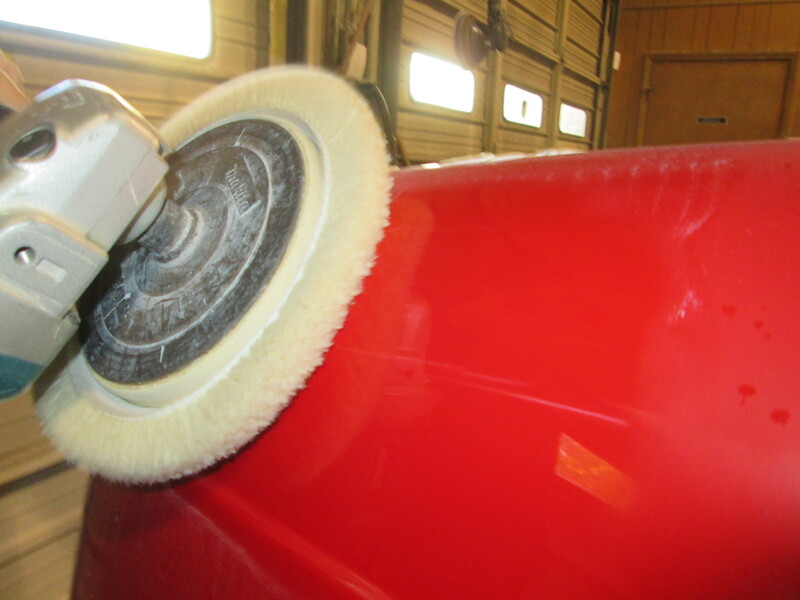 Once all that was completed we started buffing with a heavy cut compound and wool pad. 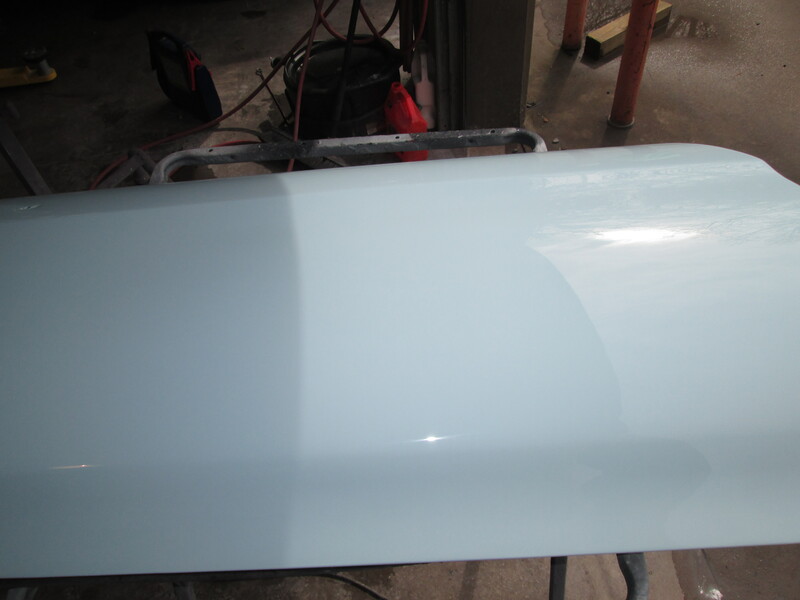 This process removes all of the scratches from the sanding process but leaves the panel kinda dull. 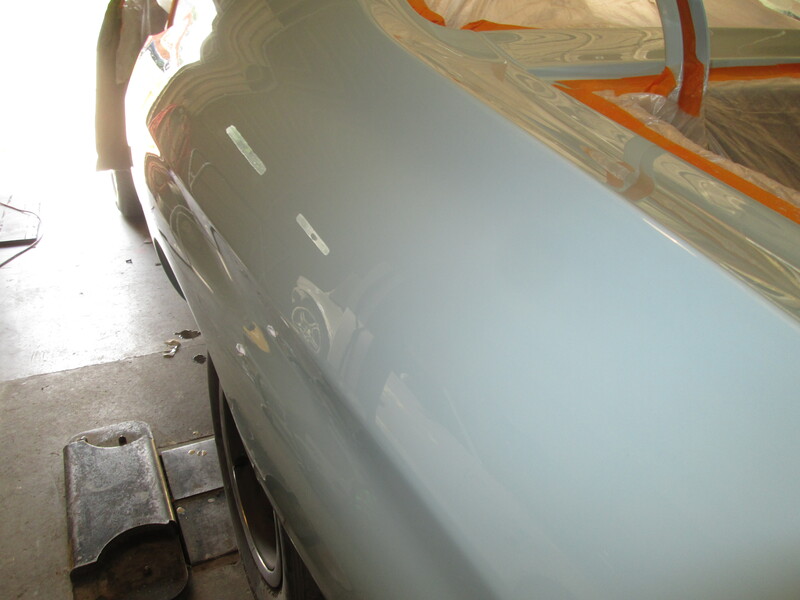 We then switched to a polishing compound. This brings the shine back up. 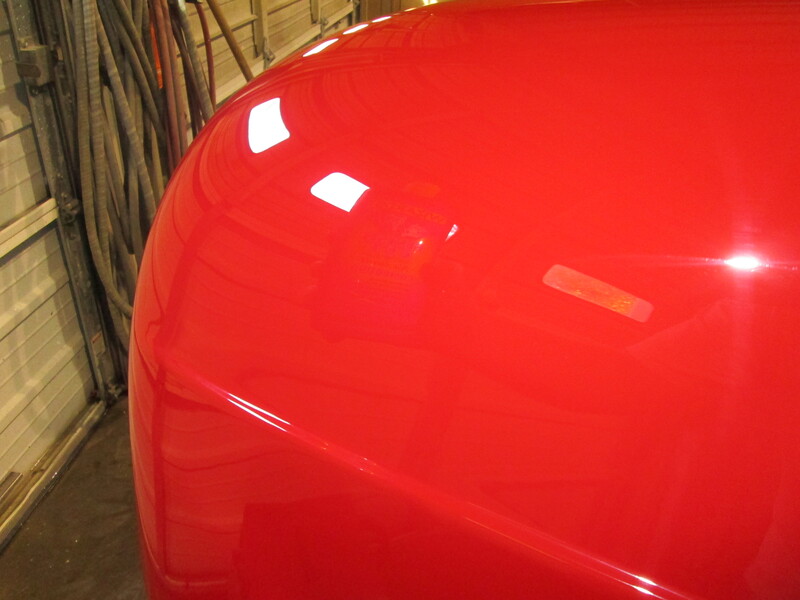 We then go over it one last time to bring out the ultimate shine. Finally we hand polished it to the immaculate shine you see here. 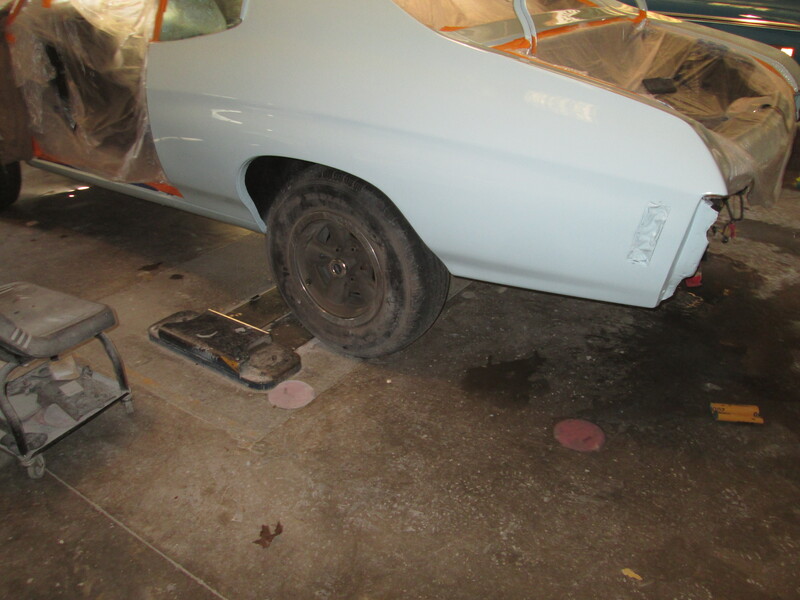 These steps were done to both rear fenders today. Not to shabby for a days work. 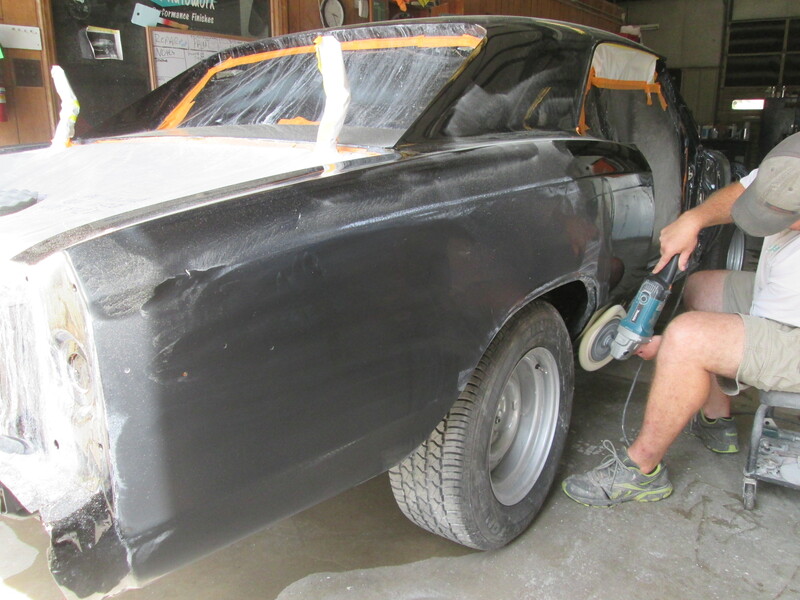 This Chevelle was painted last a couple of weeks ago. 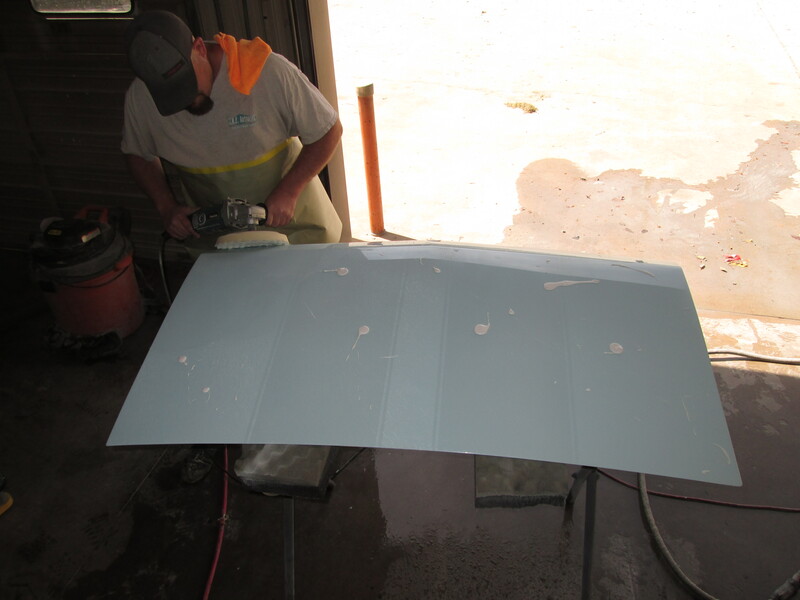 This week was time to get ultra fine sandpaper out and to make this a High Performance Finish. 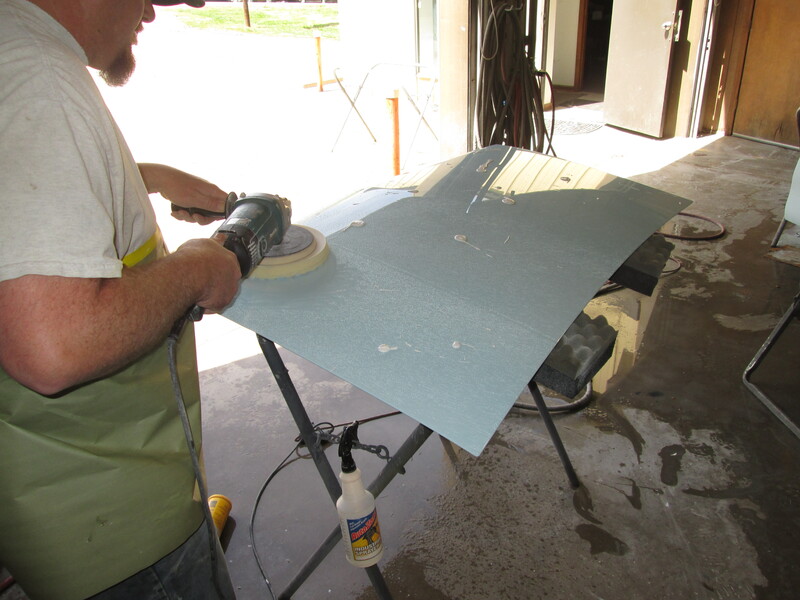 Jordan and Chris started with 1000 grit paper to make the clear smooth and flat. Once that was complete the same steps were performed with 2000 and 3000 grit paper. Which is where pick up with these pictures. 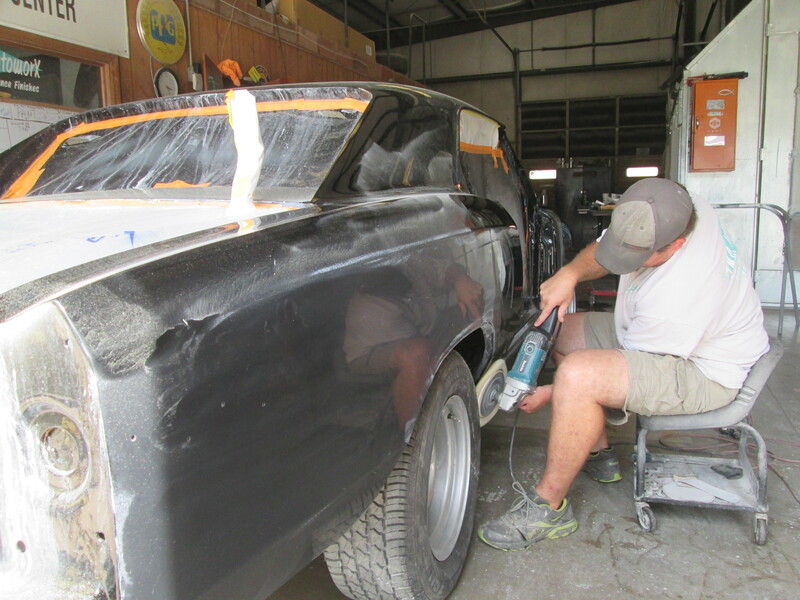 Chris has started buffing the body out. This will take 3 different steps with 3 different compounds and 3 different pads. He did get all of the first step complete today. I will pick up tomorrow with step 2. With each step the shine gets deeper and deeper. 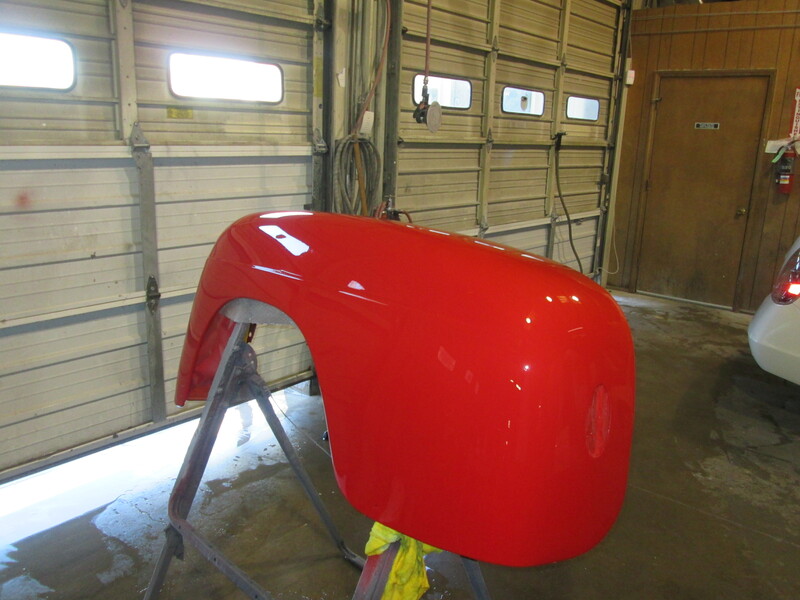 A final hand polish will put the finishing touches on the body. Look closely, you might miss it. 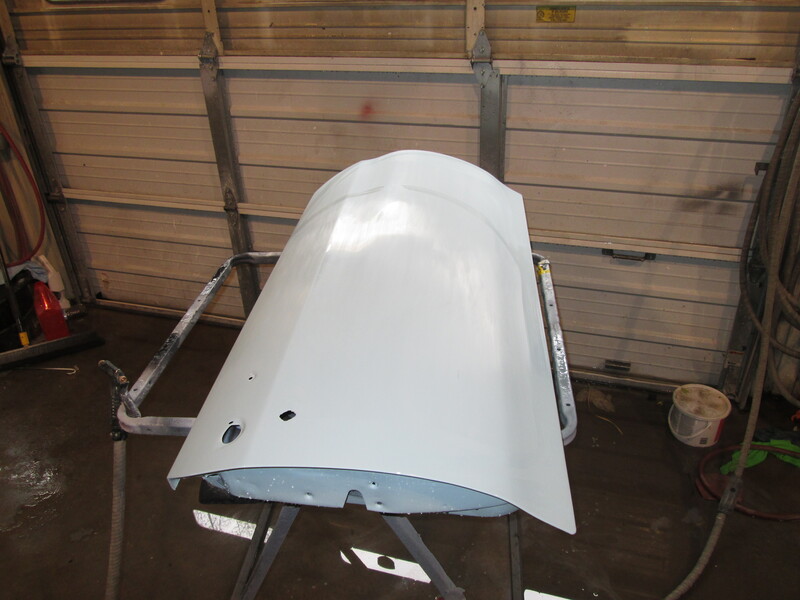 This is a few parts off of the ’71 Chevelle we have been working on. The color is quite unique. It is Carolina blue. The car is called a Carolina Girl. 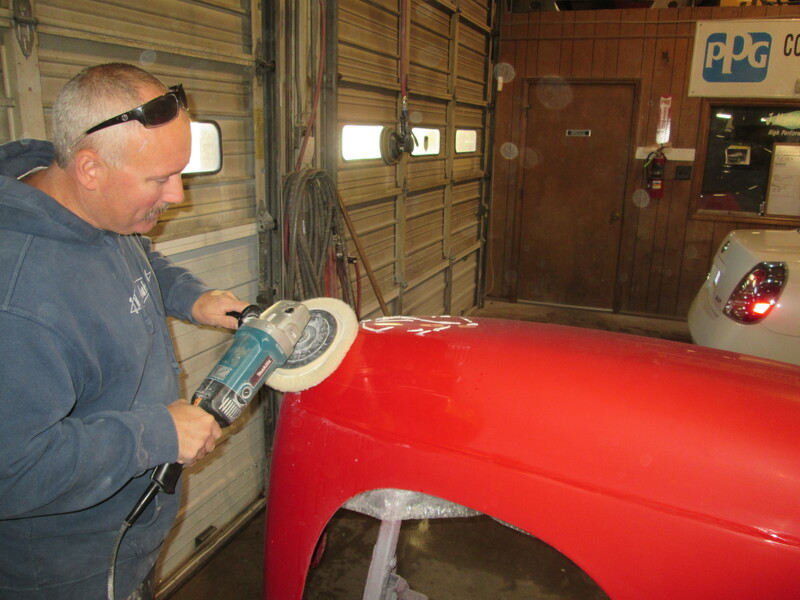 Chevrolet painted a few cars each year and sent them to North Carolina as a special edition. This one has lived its entire life in Burlington. In fact, It grew up, only about a mile from the shop. 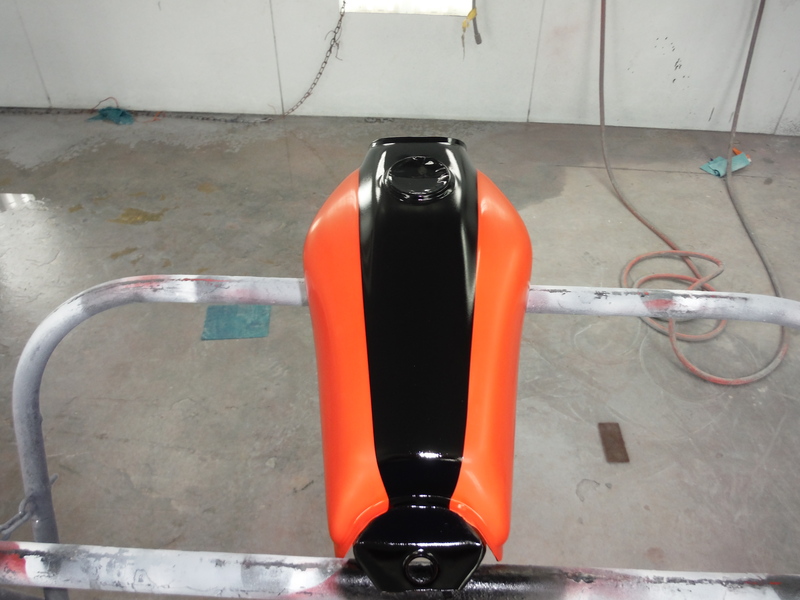 The new owner wanted to keep it the original color but wanted to add his personal touch to it. Well, we figured out what that touch was going to be this week. 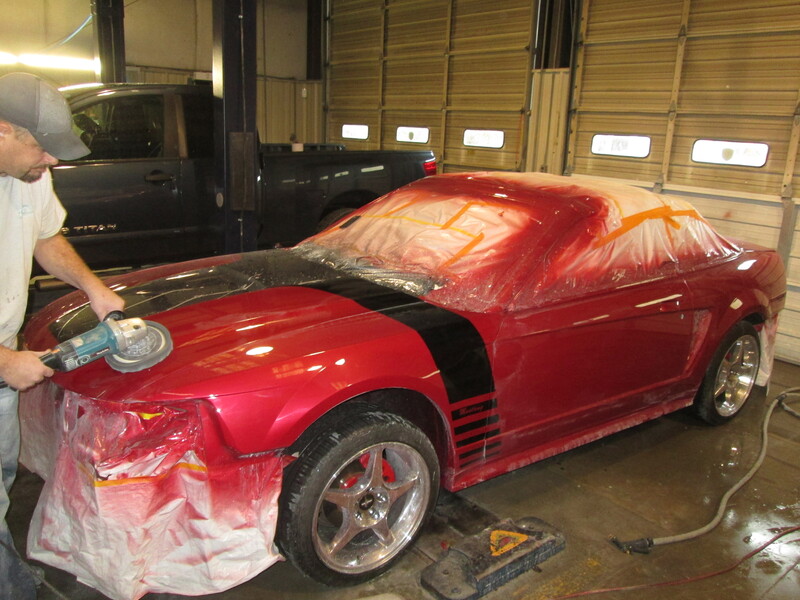 He likes racing stripes, but didnt know for sure if he wanted them on this car. When we described how we can ghost stripes, he got curious. So Wednesday we ghosted the stripes in for him to see and luck was on our side. We nailed it. If you look closely, you can see the stripes just barely visible. The owner and his family were very pleased with the way they turned out. 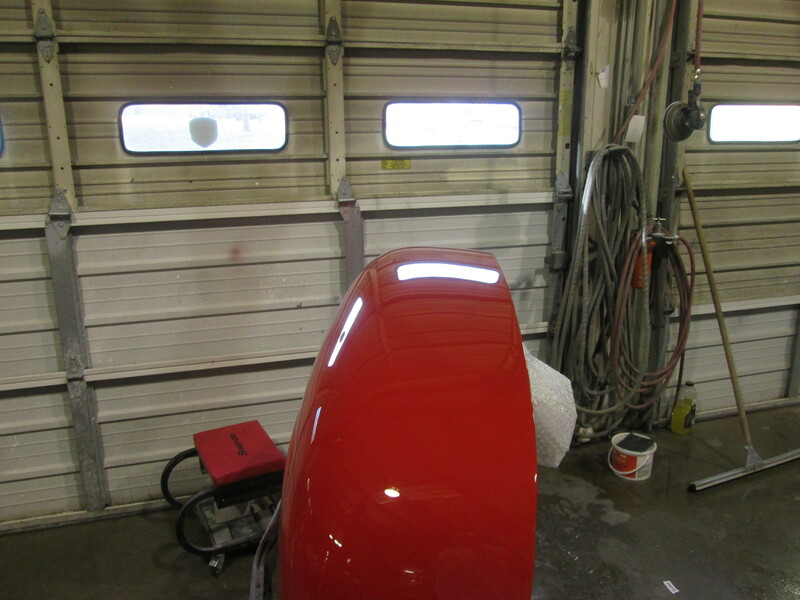 We also wet sanded and buffed the fenders today. 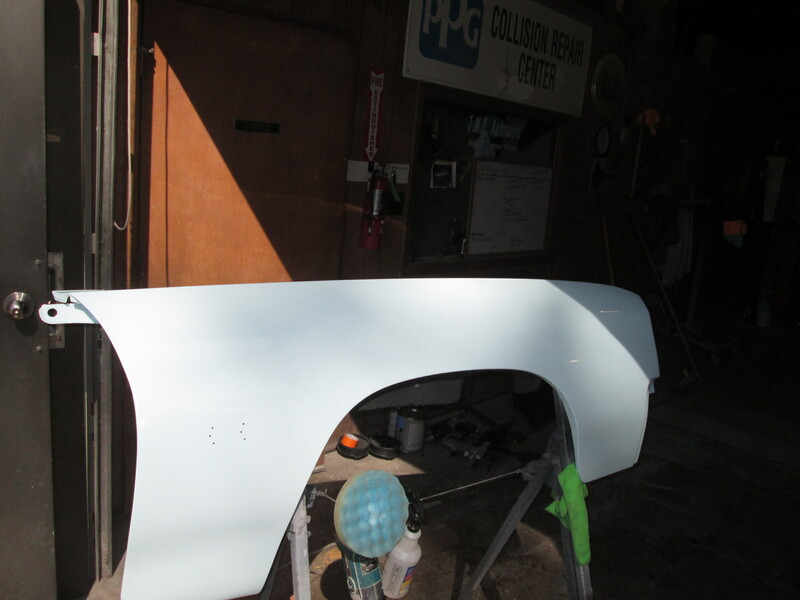 This process is part of our “High Performance Finish” paint jobs. 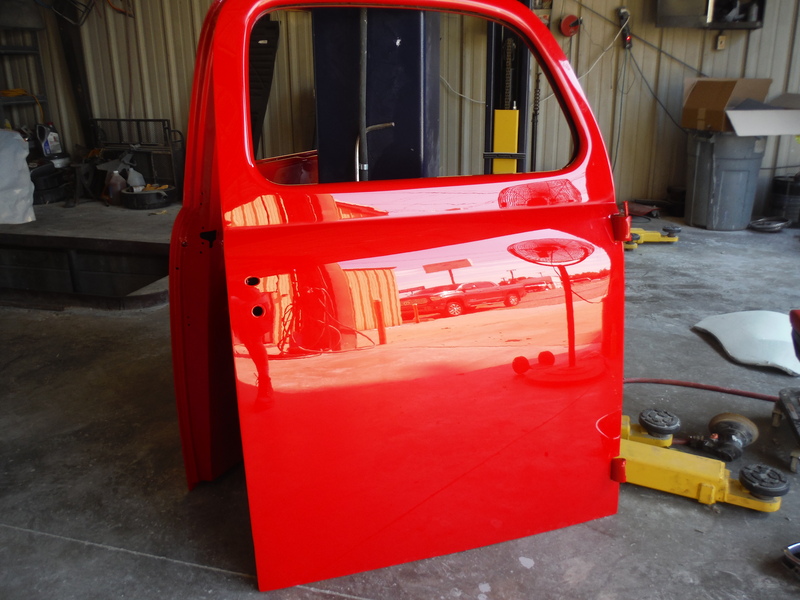 We did get the doors buffed out last week, so all thats left is to buff the body and paint the stripes on the hood, then reassemble. 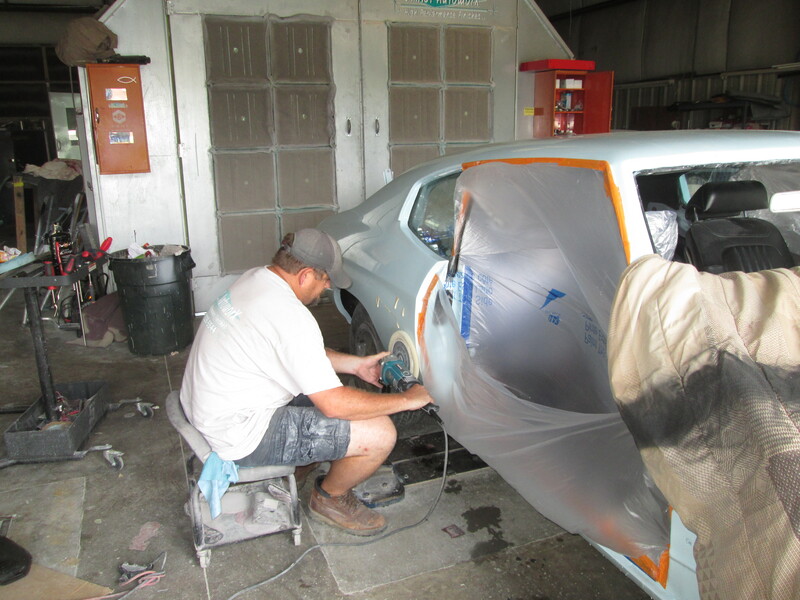 Yesterday we pulled out the doors for the Chevelle. Jordan wet sanded them starting with 1000 grit, then 2000, followed by 3000. 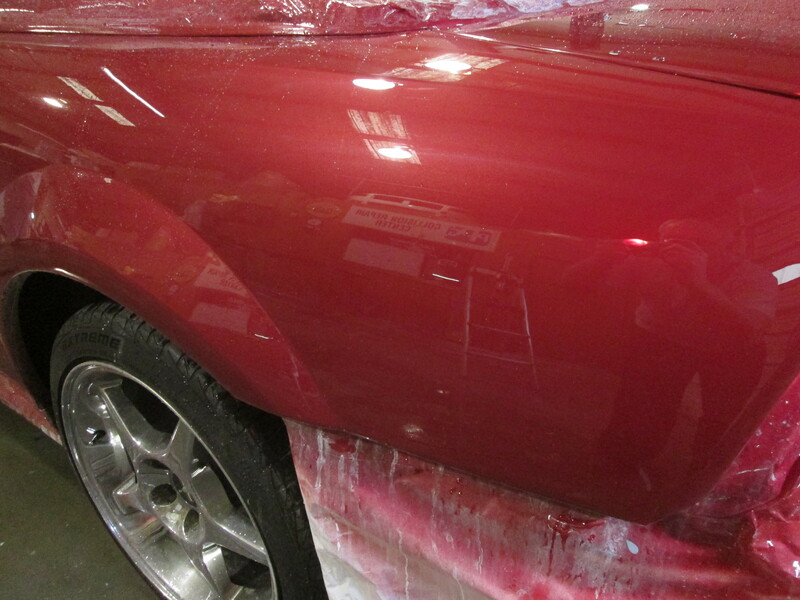 Once he had that done, Chris buffed them back up to a brilliant shine. 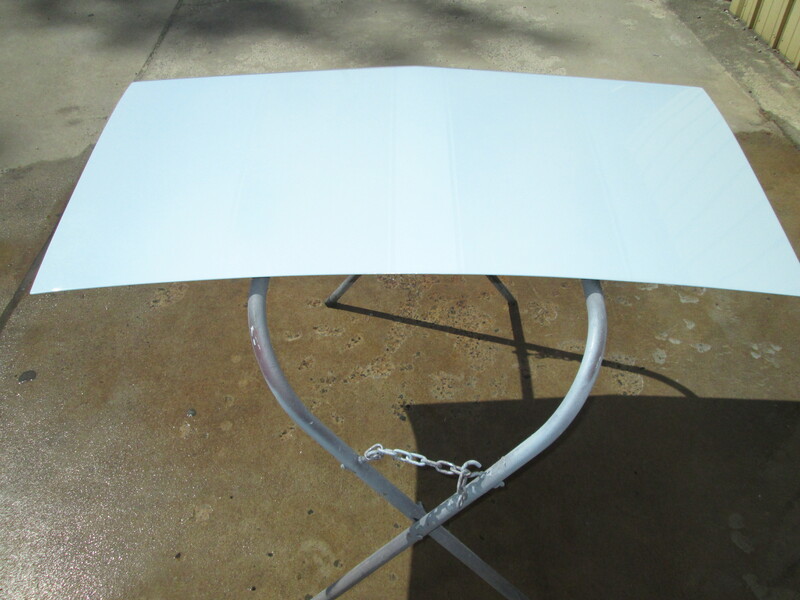 Just like the sanding process, the buffing process has 3 steps. 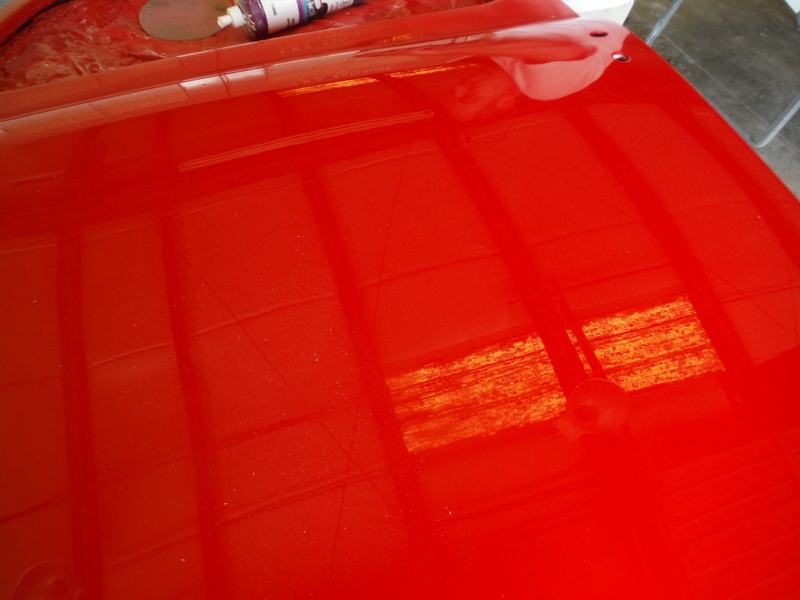 First step is a heavy compound followed by a medium compound then a light polishing compound. 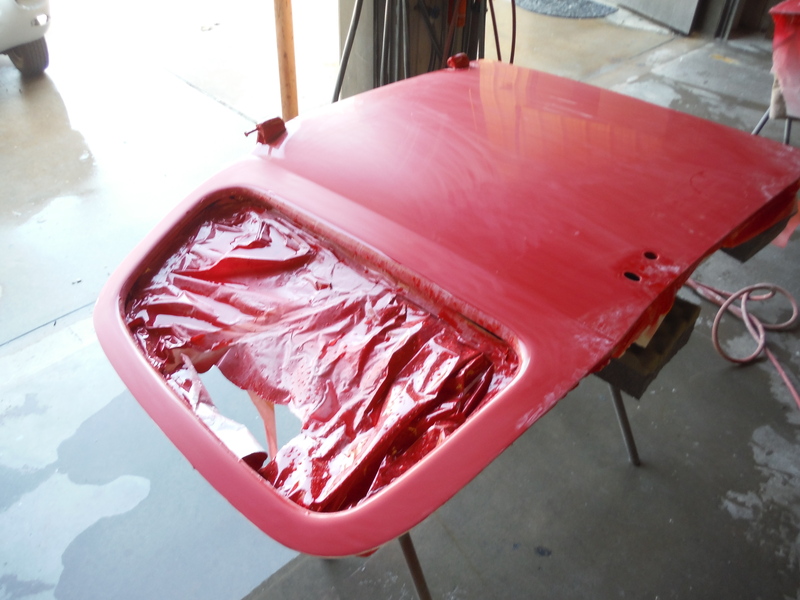 The purpose of these steps is to remove any orange peel in the paint. This is where the ultimate gloss comes from. 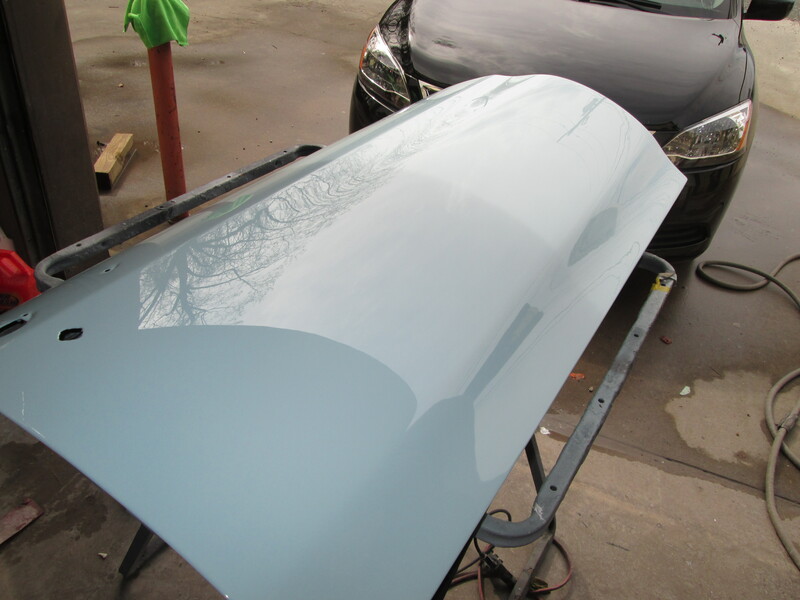 These extra steps are labor intensive but really make the paint pop right off the car. 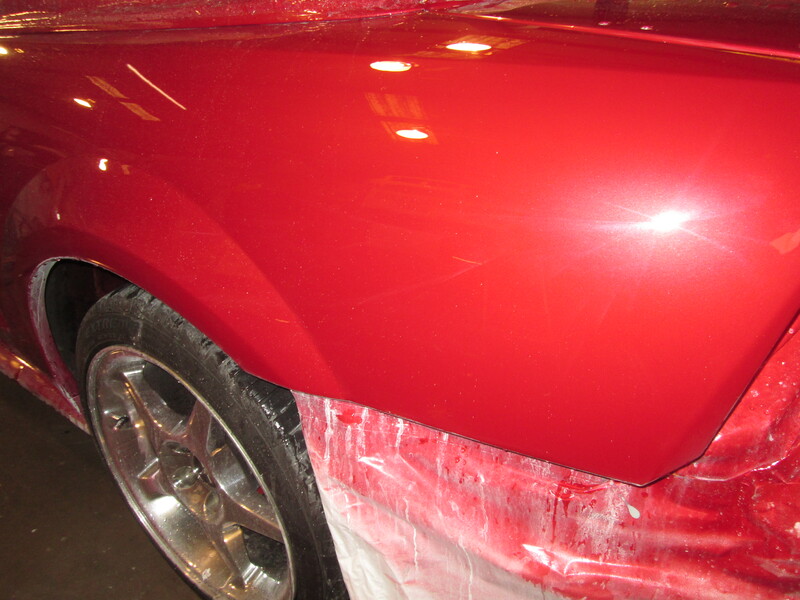 This is what distinguishes a High Performance Finish from a standard paint job. 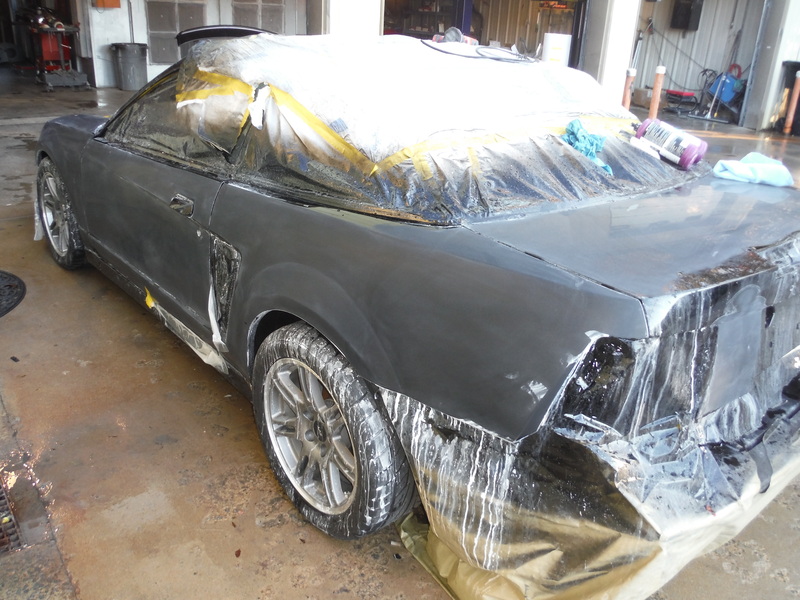 The Mustang make over is a little closer to being done. 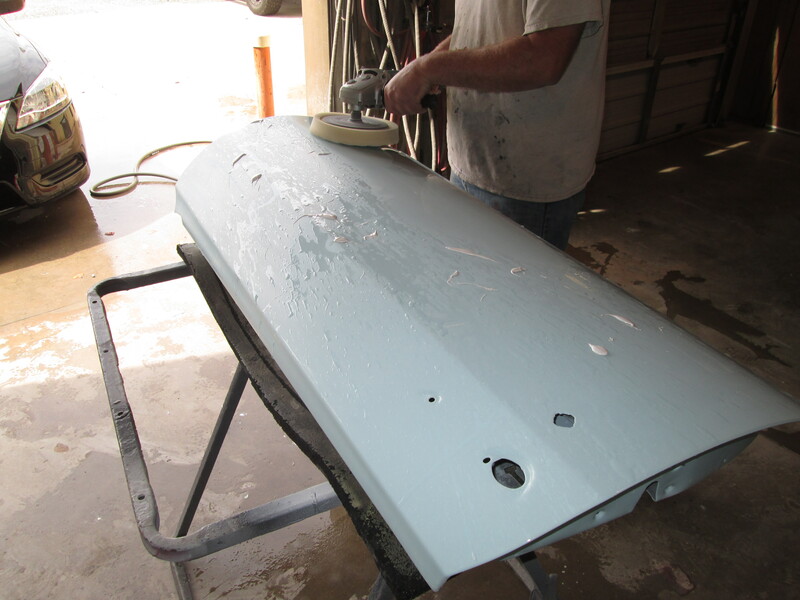 Chris worked the buffer today to bring the shine back up after all the wet sanding was complete. We started wet sanding it yesterday. 1000 grit followed by 2000 grit then finally 3000 grit paper. 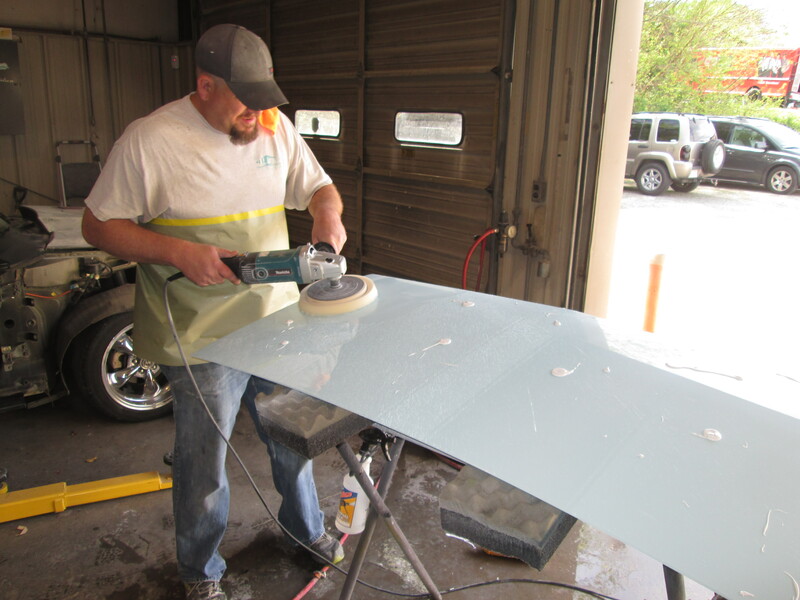 When buffing, the best procedure is to start with a heavy cutting compound then switch to a light cutting compound followed by a light polishing glaze. 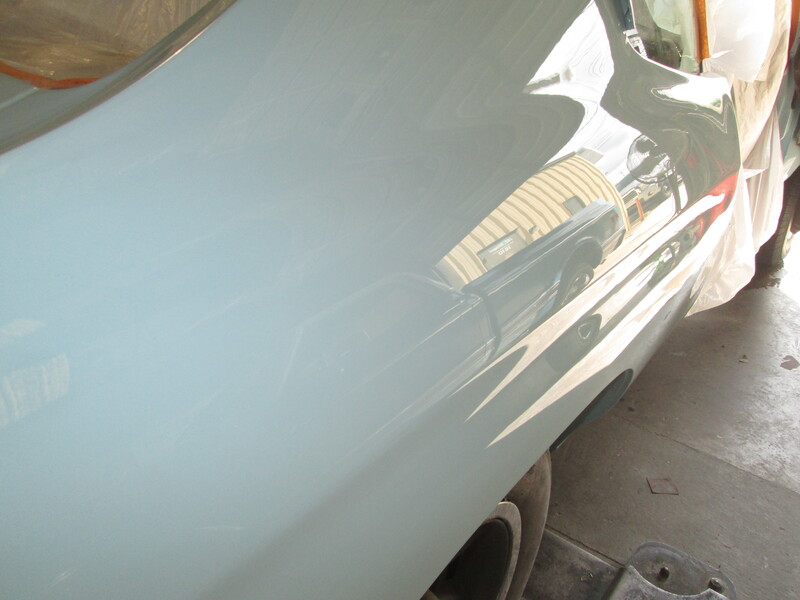 Then a good ole fashioned hand polish will bring the shine back to life. 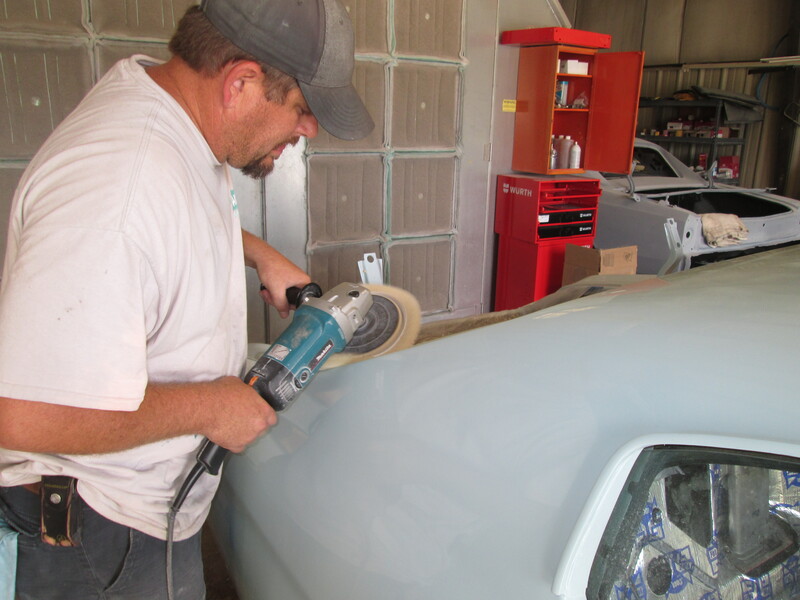 Chris was able to get 2 of the buffing steps complete. 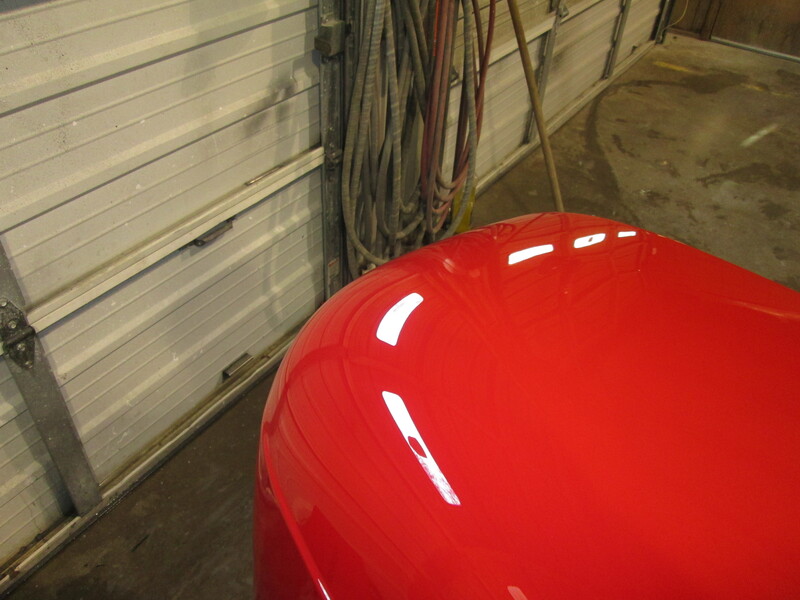 Tomorrow we will get the final polishing glaze done and the hand polish. We should have time to start putting it back together as well.